We started of with 2 runners on Friday with Cave Top heading to Uttoxeter and Arthurthedelegator heading up north to Newcastle. Cave Top got the day off to a great start finishing 3rd in a competitive maiden hurdle beaten only 5 lengths by the winner and a further 17 lengths back to the 4th placed horse. He is a horse we have always liked since being purchased at the may sale at Doncaster and certainly looks like providing Jocelyn Rosenburg with plenty of fun in the coming years especially when over the larger obstacles. It was then over to Arthurthedelegator in the 7 furlong nursery and he certainly didn't disappoint, after quickening clear at furlong pole before holding on for the victory. He showed alot of speed on this occasion and i am looking forward to bringing him back a for a very excitable 3 year old season, we will geld him now before he has a deserved break. It was great to have a winner for Eric Brook who has supported me since i started training pointers and hopefully will continue to have horses here at Stockton Hall for plenty of years to come. We then moved on to our sole runner on Saturday with Big Brother George going to post for the novice hurdle, he finished a very pleasing 5th on his only previous start at Uttoxeter and was making his hurdling debut here and ran a good race to finish 3rd behind a highly thought of horse who has recently been purchased by JP McManus for a lot of money. Big Brother George is a very good looking 4 year old son of Milan and certainly looks like the type to look forward to in the future. It has been a quiet start to the week runners wise but we have 3 runners on Thursday. 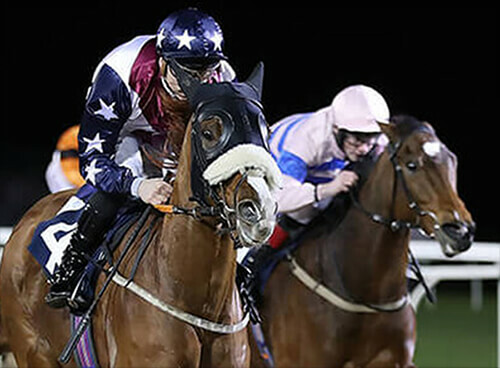 Spirit of the vale heads to Chelmsford for the 1 mile 2 furlong class 7 handicap, it is her first start in a class 7 and she should have a good each way chance if she can repeat her only other visit to the track when finishing 6th in a better race. We also head to our local track Bangor on Dee with 2 runners in the 3 Mile Novice Hurdle, Come on Louis is having his 4th start over hurdles and will be seen in better light when in a low grade handicap. Badbadleroybrown is making his hurdling debut after winning his point to point and finishing 3rd and 5th in two bumpers. He looks like the type to make a nice hurdler and hopefully he can make a pleasing hurdling debut tomorrow.